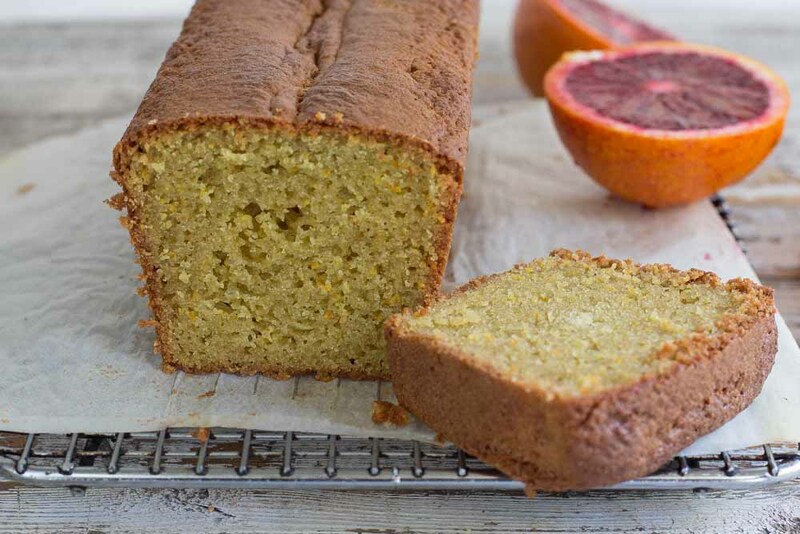 This Orange Loaf Cake is easy to make. I used Red Belly Blood Oranges to make it even more delicious. 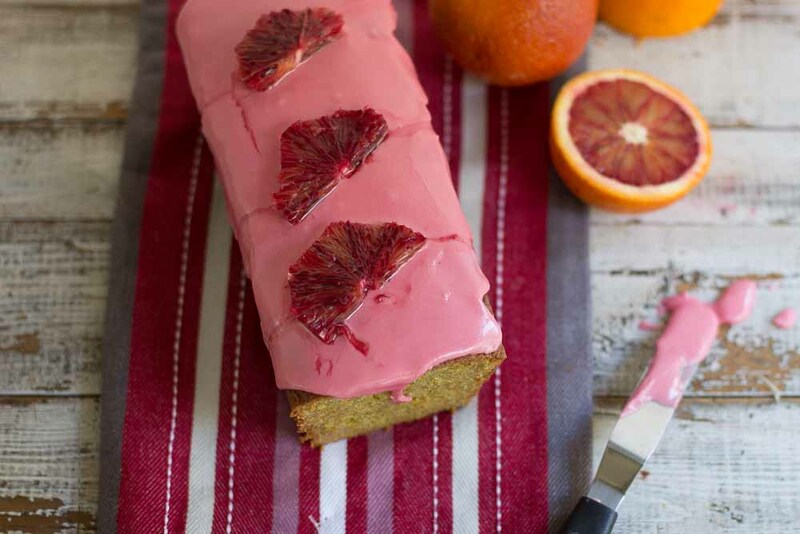 This Blood Orange Loaf Cake is really quite the stunner. It is easy too, you just need to make it using a food processor, throwing in all ingredients to just combine. It literally takes minutes. That’s because I have done all the hard yards for you and worked on this recipe till it behaved. I made this 8 times. I was like a dog with a bone. Each and every loaf was delicious (and got eaten) but they had a hole in the centre when cut open. It drove me crazy. But this now is perfected. 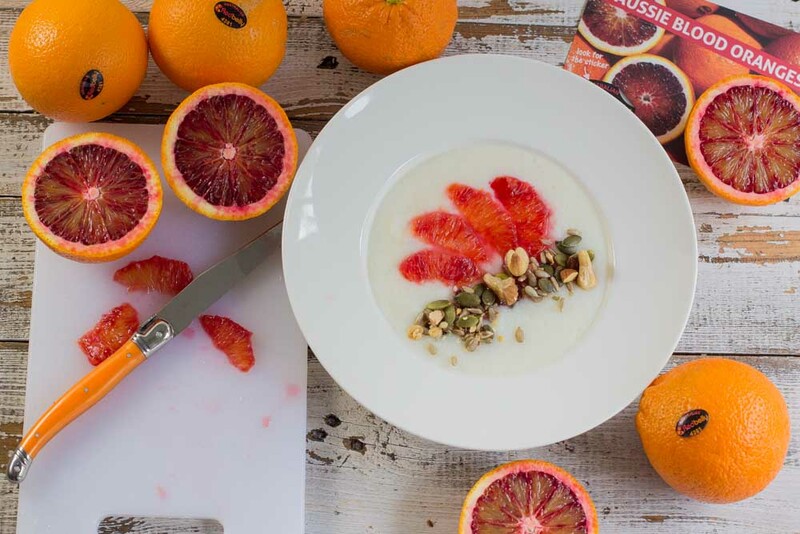 It’s made with Australian blood oranges. I think Red Belly Citrus who grew these may have perfected their oranges too, which is why I worked so hard to make sure this recipe was a winner. Last year they sent me some Oranges and I made this Warm Blood Orange and Olive Oil Cake and this Blood Orange Cheese Cake Brownie. This year the oranges were just as freaking amazing so I needed this cake to be great. I am going to tell you about them because you just will not believe the colour. I know there are other blood oranges out there but really if someone does something well, something you admire you just want to praise them. That’s Red Belly Citrus. 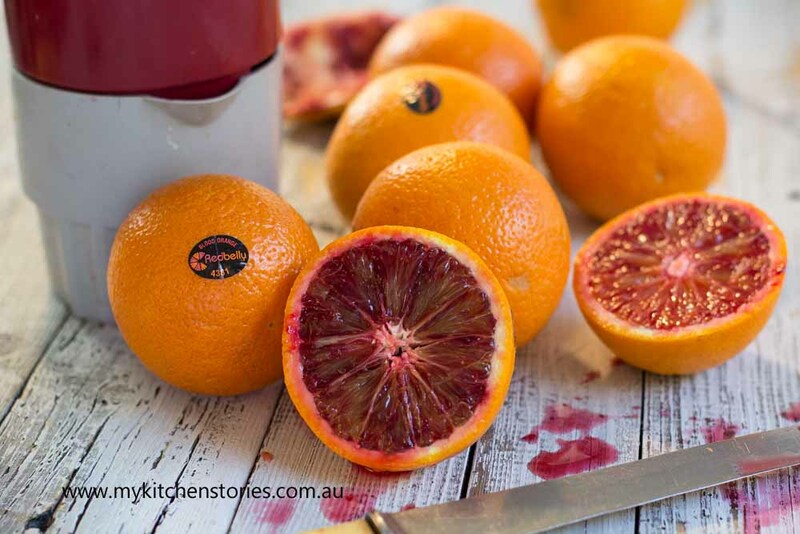 After three generations of farming the Mancini’s, Australian decedents of a Sicilian family have managed to capture the colour and flavour of the blood oranges on their property near Griffith. Here they have found the temperature variations that make a blood orange do it’s extraordinary colour transformation. I also made this really lovely snack when I had visitors drop by. I paired the blood Oranges with Goats Cheese and it was definitely a winner. 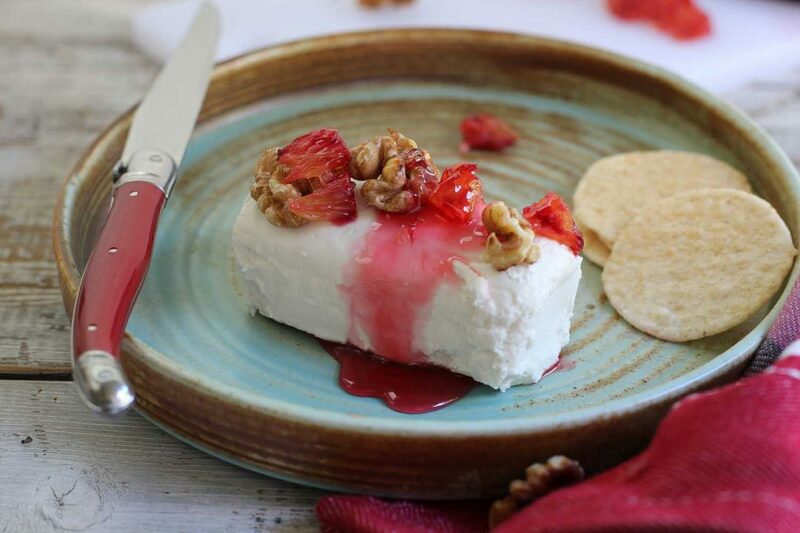 Put a cup of ruby Red Belly juice into a pot with a cup of sugar and reduce the syrup by half before drizzling the chilled syrup over fresh Goat Cheese log. I added toasted walnuts and some small pieces of blood orange. I even made them into an unusual breakfast. White polenta is one of my favourites. I always eat too much. At least this bowlful didn’t have cheese in it. I made it with water finishing off with a little vanilla and honey. I ate it with filleted blood oranges and a little sweetened syrup. I added just a touch of rose water. Can you imagine?. Always and always crunchy nuts and seeds because I can not live with out them…. and this is what you get. Back to that Blood Orange Loaf Cake. That’s why we are here after all. Don’t forget to watch the video. I can’t imagine why you couldn’t make it with other citrus fruits too. Oh no, I have thrown myself another challenge there. Put the zest and sugar into the food processor and process till the sugar turns orange. Add the nut meal and plain gluten free flour along with the soda. pulse once or twice just to combine. Pour into the prepared loaf tin and bake for 45 minutes or until a skewer inserted into the cake comes out clean. Cool for 10 minutes and then run a knife around the edge of the tin to loosen. Lift the loaf out of the tin and cool completely. Put the icing sugar into a bowl and add the 1 tablespoon of juice. Stir well. Add another teaspoon of juice and stir again. if needed add another teaspoon of the juice and stir till smooth. Spread over the cake and leave to dry. 1. Don't use a Self raising flour here. This will mess up the balance of soda and acid. 2. When making the icing add just a little liquid at a time giving it enough time to hydrate. If the icing has too much liquid in it it won't dry. in fact it will just drip off the cake. 3.To make this loaf without a food processor, zest the orange and then squeeze it . Then mix all the ingredients together. The loaf cake looks excellent, Tania. 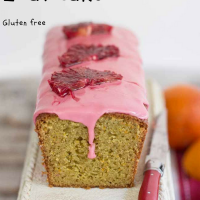 I love the beautiful crumb and the blood orange icing makes it even more tempting! What a beautiful cake – I love the icing and oranges on top. You made this 8 times?! I wish I lived next door to you. what a beautiful cake! i’ve only had blood oranges a handful of times but i do love it. this is awesome! Absolutely gorgeous, Tania. I love Redbelly oranges. Hey! 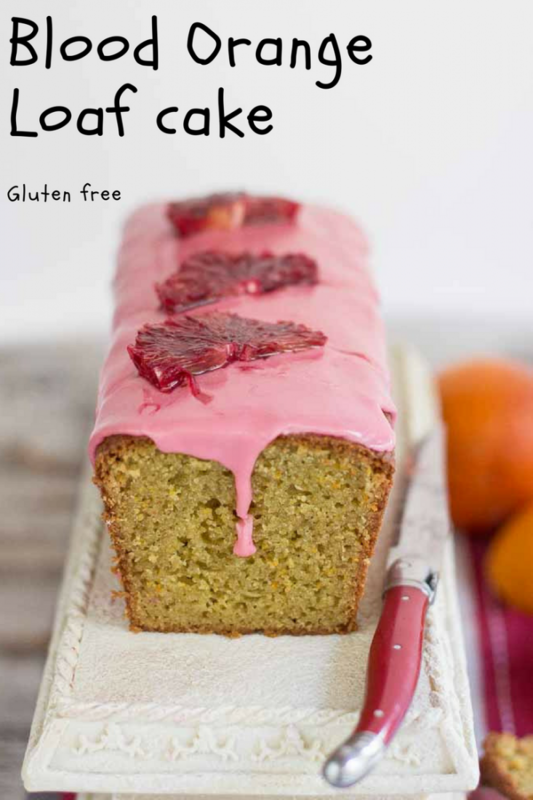 Blood Orange Loaf Cake is worth a trying! Looks beautiful Tania. Bought some Red Belly blood oranges yesterday and now I know what to do with them! I don’t have gluten free flour, and I see you say don’t use SR flour, so would regular plain flour not work? Could I use more almond meal instead? Thanks for all the great recipes. Hi Jessica. You could use regular plain flour. I don’t want to give you substitutes from the top of my head without testing though. So if you do this you may need a little less than the 150 gm. regular flour is quite a bit dryer than gluten free. Maybe 100 gm? Again I would prefer to test it before giving you advise. PM me. wow… Absolutely amazing… What great recipe. Just amazing. Thanks for sharing.